Being taught by highly qualified staff makes a difference to the education of nursery school children in Scotland, a report has concluded. 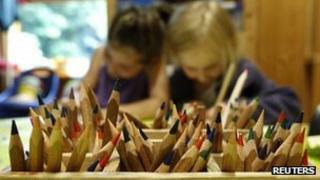 Watchdog Education Scotland studied the impact of staff qualifications on pre-school youngsters. It said staff should be given the opportunity to improve their skills. Teaching union, the Education Institute of Scotland, said parents should know how many hours their child spends with a qualified teacher. The education of early learners in local authority and private nurseries is carried out by a combination nursery nurses and pre-school teachers. The report "Making the Difference" said that the best experience for pre-school children occurred when there was a range of staff with "complementary skills and higher-level qualifications". Education Scotland, which was set up by Education Secretary Mike Russell with the aim of improving quality in education, gathered information on staff qualifications during 336 pre-school inspections. Bill Maxwell, chief executive of the organisation, said: "Few can now doubt the importance of ensuring the best possible educational experiences for our youngest children, and the positive investment that represents for individuals and for society as a whole. "What this publication shows is that particular higher-level qualifications do make a real difference to improving young children's learning. "Also, the commitment of staff to undertaking additional qualifications while in work is contributing to giving our youngest children the best possible opportunities to learn and grow as responsible, confident individuals." The impact on the quality of children's experiences was less where staff had not undertaken additional high level qualifications or training. The BA Childhood Practice Award was beginning to show a positive impact on children's learning in the early years. There was a significant variation in access to a teacher across the early years sector. Where a teacher had a background in early years methodology, this tended to make a positive difference to children's learning. The report also said that it was important that staff received support when they undertook qualifications such as the BA Childhood Practice Award and it recommended that there needed to be opportunities to improve the skills of the teaching workforce in early years education. Children's Minister Aileen Campbell said: "I welcome this report and its findings that the best experiences for young children are where there is a range of staff with higher level qualifications. "Teachers are important to ensuring high quality early learning and childcare, particularly those with a specialist background in the early years. "All early years managers are now required to hold or be working towards the BA Childhood Practice Award. The report notes the positive impact of this measure and we will continue to monitor this closely."